[FTC Disclaimer] Technically, this is not a sponsored post, as I have taken a break from sponsorships this year. However, in the spirit of transparency, we still have a close working relationship with the folks at Certified Angus Beef® Brand and Thunderbird Wings. I love breakfast for dinner. Chicken and waffles. Huevos rancheros. And of course, steak and eggs. 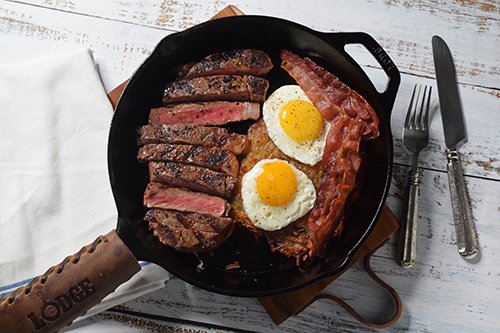 Prime ribeye, Yukon gold hash browns, fried eggs, and some of our home cured and smoked bacon. 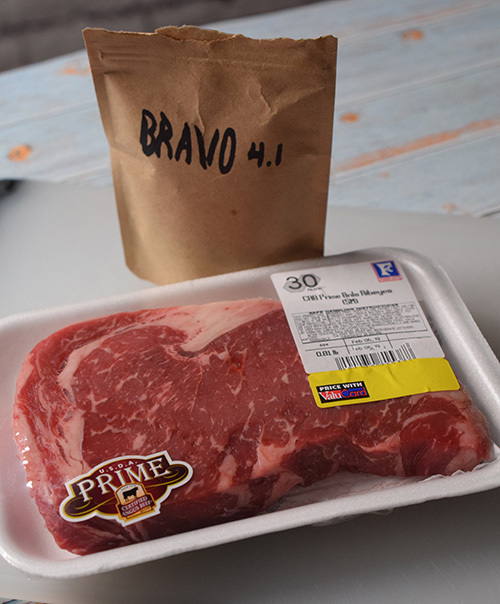 Alexis and I shared this for dinner the other night when she found a USDA Prime, Certified Angus Beef® Brand ribeye steak at our Food City. I'm so glad that Food City carries the Prime grade. I don't get Prime every time but it is a treat when we do. Being less than an inch thick, it was perfect for steak and eggs for dinner. Alexis and I were sous chefs for Trace Scarborough of Thunderbird Wings at an event last year. He gave me this new beef rub that he had in development - Bravo. It is based on the Mexican mole sauce profile - earthy, deep, rich chile, smoky, and with the most subtle hints of chocolate. I love that unique approach to a beef rub. I've had to be quiet about it until now because it is finally out for sale. 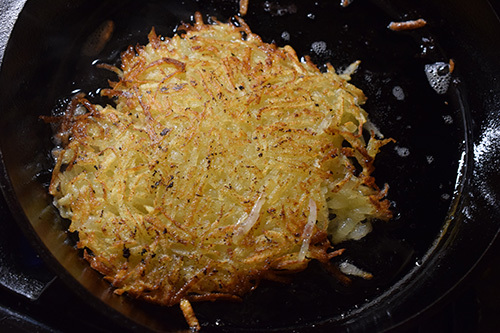 For the hash browns, we shredded a couple of Yukon gold potatoes and pressed them in paper towels to dry them out. I seasoned them with salt and pepper and then fried them in a cast iron skillet over high heat for 6 minutes on the first side and 4-5 on the other. These were killer. I debated whether to pan sear or grill the steak, both have their merits. On this night, I decided to just go straight on the cast iron grates over natural hardwood lump charcoal. I patted the steak dry, applied a little avocado oil (tasteless, just a good high temp oil), and seasoned it with the Bravo. 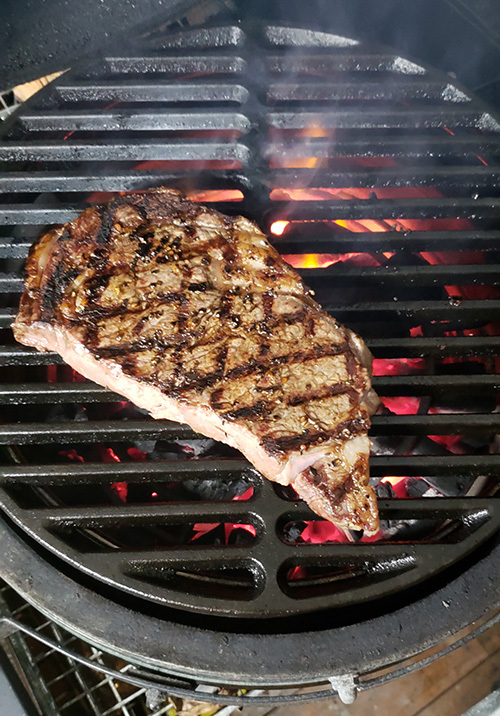 Since it was a breakfast steak, I grilled it for just 3 minutes a side over a 550°f fire on my Mini-Max. 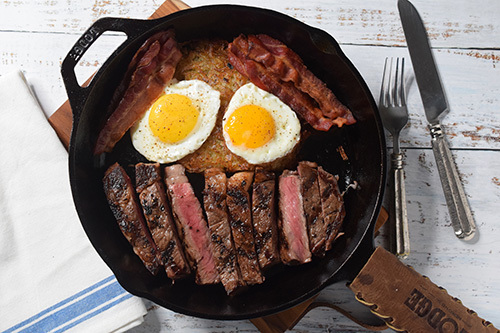 Alexis cooked up some of our Brown Sugar and Bourbon bacon while I fried two sunnyside up eggs seasoned with our finely ground NMT Beef Rub v.2. 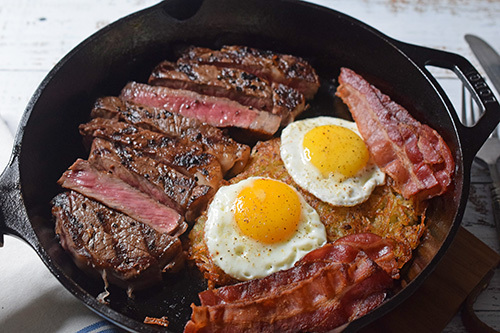 Yes sir, it is hard to beat a steak and eggs breakfast.....for dinner! Smile all you want....I'm still coming in with a knife and fork!